One of our goals as small business owners is to support other local businesses in our area. As it turns out we are fortunate to live in a community that is bustling with many “mom and pop” shops and restaurants that reflect the true character of our beach. It makes us happy to send our guests to some little store where they find just the perfect trinket to bring home from their journey. 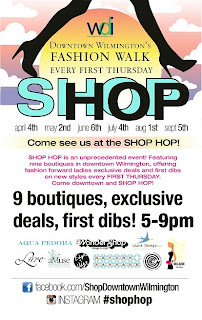 So ladies we would like to share with you the “First Thursday Shop Hop” coming up this September 5th. From 5-9pm. It is a great chance to get first dibs on new fashions, get some exclusive deals and most importantly to support our small local businesses! Some of the participating boutiques include Island Passage, Edge of Urge, aMuse and a number of others. We hope you will explore our downtown area-grab a bite to eat, perhaps enjoy some wine and buy yourself something fabulous to take home with you!